Do you want to learn how to transform one of your photos into sophisticated type, so that the primary features of the image are revealed in the type? The most effective way to do so is using the type mask tool, which has been in photoshop for over a decade, although few users take advantage of its capabilities. Here is my favorite type mask technique for creating picture or image type. First, choose a picture with clearly recognizable features so that you can still see the primary characteristics of the image when a large portion of it has been deleted. 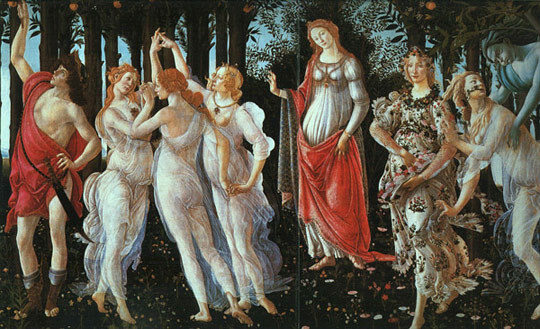 We're going to a reproduction of Botticelli's Primavera, as pictured below. If you wish to practice with the same image, simply right click on it and save it to your computer. Second, decide one word or two or three short words which you wish to create from your photo - preferably a word or words which will convey a message you wish to impart. For example, you might want to use the image of a sky with clouds to create a heading that says CLOUDS or the image of man sleeping in a hammock for the words TIME TO RELAX. We're simply going to type the name BOTTICELLI. Third, check out the fonts on your computer and select a thick, heavy font (such as Impact, Swiss 921, or Poster Bodoni Bold). Since your image will only be revealed through your type, you want type which takes up as much space as possible. Before you begin, note that you cannot easily undo all your steps when using the type mask tool, and you cannot edit your type once you turn it into a mask. You can, however, use your history palette or control alt z to undo your type mask and begin again. 1. Use file, save as to save your image in the .psd format. 2. In your layers palette, click the new layer button at the bottom of the palette to create a new layer about your background layer. This step is essential. The type mask tool, unlike the type tool, does not automatically make a new layer, and you will not be able to create this masking technique without a separate blank layer. 3. From your toolbar, in the type segment, choose the horizontal type mask tool. Unlike the regular type tool, its symbol has dotted lines around type. 4. Open your character palette and make sure that your tracking is set to 0 or a negative number. In most cases, you will want fairly tight tracking in order to fit ten or more letters in large type onto your picture. 5. Choose a thick, heavy type such as Impact or Poster Bodoni, and a large type size - but one small enough that you are sure that the words you will type will fit on top of your picture. 6. 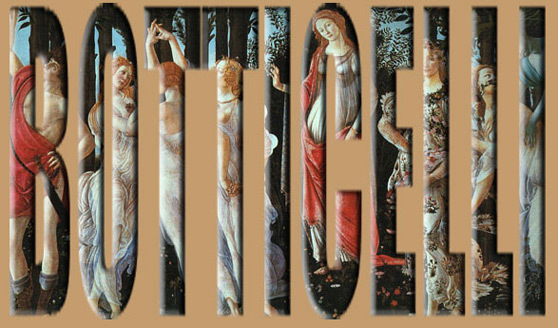 Click at the left center of your image, and type your word or words. 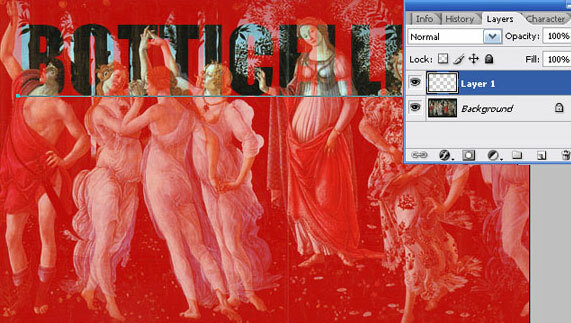 In this example, we will type the word Botticelli. Since capital letters will take up more space and reveal more of the image than small letters, we will use capitals. Notice that when you are typing in the type mask tool, your screen will show a red mask.